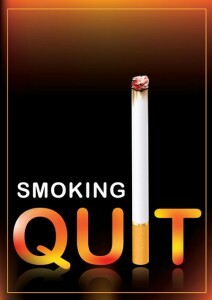 Hypnosis has shown to be helpful for people who wish to quit smoking. The treatment is done is one session. 20 minutes after quitting smoking, blood pressure returns to normal. 8 hours after quitting oxygen levels in the blood improve. 14 hours after quitting carbon monoxide is eliminating from the body and the lungs start to clear the mucus and other smoking debris. 72 hours after quitting breathing becomes easier, the bronchial tubes start relaxing and energy levels increase. 2-12 weeks after quitting circulation improves through out the body making walking and exercise easier. 5 years after quitting the risk of heart attack reduces to about half of what it would be for a non-smoker. 10 years after quitting the risk of lung cancer falls to that of a non-smoker and the risk of a heart attack is reduced to the same as a person who has never smoked.